BoaterSports High Quality Anchor Lines are a perfect match for your BoaterSports Anchor. These lines are constructed of high quality, marine grade material, UV stabilized for the harsh marine environments. BoaterSports Anchor Lines are designed to maintain their flexibility, strength and abrasion resistant qualities, ensuring ease of handling whether the line is wet or dry. Because of its light weight, polypropylene is the only rope which floats. Because poly is less expensive than other fibers, it is the most popular all-purpose rope for the average consumer. Hollow braided poly can be easily spliced. 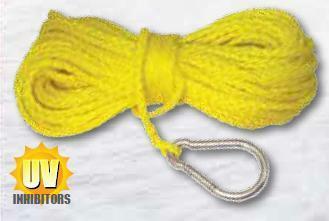 Yellow polypropylene anchor line with spring hook.